Northern Laos–mysterious and definitely the road less traveled. Rolling countryside and rice paddy fields are abundant as you drive through the hills stopping at remote villages. Weaving is the traditional art and women are seen everywhere making their colorful patterns. The Phongsaly province is a fresh place to explore. Meet the Mouchi tribe, one of only 6 Mouchi villages in the province. Enjoy a traditional welcome massage. Take a private boat down the down the Nam Ou river. Via driving, trekking and boating you discover the real face of Laos. 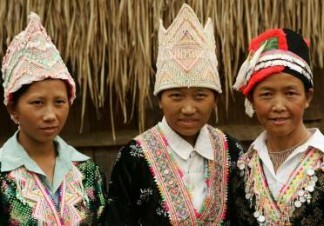 Tribal Laos is for the traveler who thinks he has seen it all! You are met at the airport and driven to your charming accommodation. The rest of the day is free for you to relax. After breakfast we visit the quaint Royal Palace Museum, which gives a good overview of the local history and features a guided audio tour. We then begin our temple tour taking in some the cities most beautiful structures, including the country’s most historic and enchanting temple Wat Xiengthong, with its roof sweeping low to the ground, representing the classical Luang Prabang style, as well as the unique Wat Mai, with its five tiered roof and Wat Visoun, known as ‘The Water Melon Stupa’ due to its shape. After breakfast, we visit the local Phosi Market, this is the place where all the locals shop and your guide will show and explain to you the diverse offerings on display. We also stop at Ock Pop Tock, a silk weaving center. Here you will be given a guided tour and the silk weaving process will be explained. We then drive out of the town where you have the option of stopping to visit Khmu, Hmong and Lao Loum villages, representing the main ethnic groups of Laos. Note: Accommodation is very basic home stay. No running water, no toilets, and a public shower used by the whole village. Following breakfast at the village, we trek for a further 3 hours to an Akha Eupa village for a simple lunch. We then transfer directly to Phongsaly, where we can climb a hill to witness a beautiful sunset over the town. This morning we head south by road to Luang Prabang. The morning drive brings us out into rolling countryside where you can admire the beauty of the Nam Ou River and the surrounding rice paddy fields. Along the way we stop to visit the mysterious caves of Pak Ou, two caves set in a limestone cliff facing the Mekong River crammed with thousands Buddha statues of various shapes and sizes. We arrive in Luang Prabang by lunchtime where you have the rest of the day at leisure. A free day at leisure in Luang Prabang to rest after your adventure – why not enjoy a spa treatment today?